The 1929 10 miles race was really noteworthy: it became a duel between him and Frank Stevenson who was also from Dundee. Smith led through 6 miles in 30:47.0 (two seconds outside the Scottish record), set a new 7 miles record of 36:01. Stevenson then took over in front and set records at 8 (41:15) and 9 miles (46:30) only for Smith to pass him on the last lap to win in 5137.8 – taking 26.6 seconds from James Wilson’s nine year old record. Stevenson was also inside the record. It seems that 1928 and 1929 were his top years as a track runner with double victories in the championships, plus third in the AAA’s in 1928 and being awarded the Crabbie Cup for the most meritorious performance in the national championships. The 10 miles record stood until no less than Ian Binnie broke it with a time of 50:11.0 at Dunoon on 28th August 1953. He was possibly even better over the country as the next table shows – five consecutive victories in the national championships and three top ten places in the international including a second and a third. It is on his country career that we will be concentrating. The 1928 International Championship was held at Ayr Racecourse over a flat course but with heavy rain falling Suttie Smith and Eckersley of England went straight to the front and after a very hard race, Eckersley was just too strong for the Scot who finished second although there were some who said he could have won had he exercised better judgment. The following year the national was held at Hamilton again and again I quote Colin Shields: “The course had tricky conditions due to an overnight thaw leaving the ground treacherous to runners. Suttie Smith set off in an emphatic manner leading from the start at such a pace that no one else could keep up with him. The crimson vested Dundee runner led by 250 yards at half distance from clubmate Tom Whitton who ultimately finished second due to his close challengers Frank Stevenson being forced to retire after a heavy fall, and West District champion CP Wilson dropping out due to a knee injury. Smith outclassed his rivals to win by 400 yards.” Selected again for the international race, he again led the team home but was only sixteenth and the team finished fifth. At the start of the 1929-1930 season Suttie Smith was part of the team with W Slidders, JM Petrie and P McGregor that easily won the East District Relay Championship at Corstorphine with Suttie Smith second fastest of the day. The national was held at Hamilton with 270 runners from 20 clubs taking part but there were several absentees because 16 clubs had their own championships on the same day. Suttie Smith won by 100 yards from Sutherland of Garscube with Stevenson of Monkland Harriers third. A week later in the English national, he was running ‘in a forward position’ when he was forced to pull out with a leg injury at three miles while Sutherland (running for Birchfield Harriers) was In the international that year, was twelfth. Colin Shields tells us that a crowd of 30,000 spectators watched the international race at Royal Leamington Spa over a very hilly and rough course. Suttie Smith’s leg was still troubling him and he could only finish thirteenth but the good news was that the Scottish team was third. The following season, 1930-31, saw John Suttie Smith running for Dundee YMCA Gymnastic Club after a fall-out with Dundee Thistle. “Suttie Smith gave a machine-like display of running to win for the fourth successive time bettering the previous record of three successive wins by James Patterson (Watsonians) 1898/99 and 1900, and Dunky Wright 1923/24/25.” He led from the start and won the race, over 10 miles, in 59:20. In the international at Baldoyle Racecourse with Smith finishing tenth and the Scottish team being equal second with France. This was their best ever position in the international fixture. Every national championship for the past four years had had the same winners – Suttie Smith won the individual title while Maryhill Harriers took the team race. At Hamilton in 1932 history repeated itself when Suttie Smith won comfortably for his fifth title in a row. He was seventh in the international, held that year at Brussels with the team finishing third. Season 1932-33 was the year of James Flockhart’s breakthrough. The Shettleston Harrier would go on to go one better than Suttie Smith and win the international cross-country championship. He won everything that year while the Dundonian again changed clubs, this time running for Canon ASC. “Suttie Smith led for the first five miles with Flockhart and James Wilson in close attendance. At seven and a half miles James Flockhart had an 80 yard lead with Suttie Smith a further 50 yards behind. Over the final lap, Flockhart drew further away to double his lead over Wilson with Suttie Smith, failing in his bid to record six individual wins in a row, third.” In the international at Caerleon Racecourse, Robert Sutherland was second and Suttie Smith third, Flockhart being injured early in the race, with the Scottish team being second behind England. An amusing story from “Whatever The Weather” concerns the trip back to Scotland when the train dropped the team at a deserted Darlington Station for their connection. In the totally deserted station they made friends with a troupe of Theatrical Variety Artistes who challenged them to a football match. The pitch was paced out and marked on the platform and in the ensuing game, the Scots won. The next challenge was to a sprint and the team manager, George Dallas, rolled up his trousers, handed his jacket, wallet, papers and spare cash to one of them and proceeded to defeat their star sprinter. The best was yet to come. Confident of success, an acrobat challenged the Scots to produce someone to race him on their hands! Suttie Smith who had been an excellent gymnast, took up the challenge and won, as Colin says, ‘hands down’! 3 – 0 to the Scots. Not in the first six in the national, Suttie Smith was nevertheless selected for the International where he finished 23rd in a disappointing Scottish team which was third although expected to be higher. His young brother Charles Smith, also a former gymnast, won the Novice title in season 1934-35 and followed with a victory in the Eastern District Championships at Galashiels. 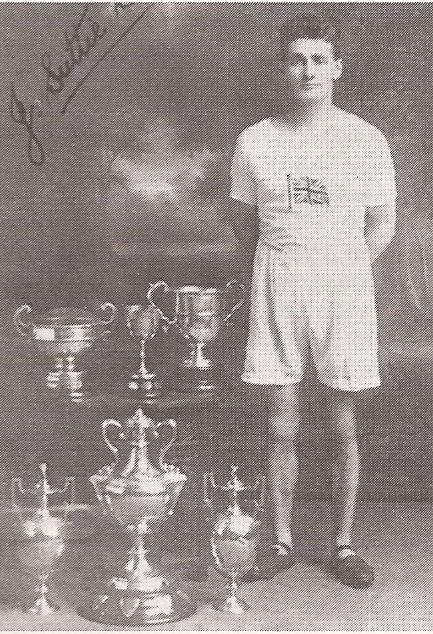 Suttie Smith (running for Edinburgh Northern by this time) was third in the National at Hamilton and led his team to the team championship with six in 33. Naturally he was selected for the international which was held at the Hippodrome d’Autevil in Paris. Suttie Smith ran well to be third Scot in twelfth place and the team was second to England. In 1936 his 5’2” brother Charles was fourth in the national with Suttie himself dropping out at half distance. He was selected for the International where no fewer than three of the team had been runner-up in previous years: himself. Robert Sutherland and C Wylie. Held at Blackpool in very hot sunny weather, he finished fourth and the team was third. In 1937 he was running for his brother’s club of Dundee Hawkhill Harriers but although Charles was fourth and made the international team for the third consecutive year, Suttie was nineteenth. An interesting sideline is that Hawkhill’s sixth counter was C Haskett in 102nd place. I can find no trace of him in any further national championships but no note of any distance runner of merit would be complete without mentioning the Edinburgh to Glasgow eight man relay which started up in 1930. In the first year, Suttie Smith ran on the sixth stage for Dundee Thistle and had fastest time by 42 seconds in the team which finished second. In 1931, there was no Dundee Thistle team in the race but his record for the sixth stage was not challenged. With no race in 1932, his club was second again in 1933 but he was not part of the team. None of his other clubs took part in the race so he was not able to showcase his road running ability in this, the blue riband of road relays. There is no doubt of his supremacy in 1928 or 1929 and it is clear that with his collection of medals on the track, domestically and internationally over the country and as a road runner that he would have been a top man in any generation. and has a lot of information about the man himself as distinct from the runner, but includes the following : When it came to training, his training routine depended on the weather. When it was dry, he ran in the country or on a local track. When it rained, he ran up and down the stairs in the Dundee tenement where he lived. All his training took place after work, at weekends or on rare days off. It was all a bit different back in 1928, when the Games were held in Amsterdam. It was not far for British athletes to travel, of course – but that was just as well for John Suttie Smith, who did not even get an extra day off work before making the journey. The Dundonian, a self-coached distance runner, had no hi-tech equipment either. He ran outside, on the track or across country, when it was dry. When it rained he ran up and down the stairs in the tenement in the Hilltown where he lived. Suttie was his middle name – there were thousands of other John Smiths, so he changed. And although he is not as well remembered now as Eric Liddell, in his day he was a star, as his daughter, Irene Gibson, can recall. Now 72, Gibson grew up knowing that her father was held in high esteem in his own community. Not because of any boasting – he did not care to discuss his own achievements – but because of the attention he got. Born in 1905, Smith was selected for the 10,000 metres at the 1928 Olympics by virtue of having become European champion the year before. In spite of that success, however, his real prowess was over a longer distance, and preferably over muddy, strength-sapping fields than round and round a track. Ten miles was his best distance, not the six and a bit which that 10,000m amounts to, and that probably showed in the fact he was only tenth at the Games. But lack of time off to prepare might also have been a factor compared to some more leisured opponents. A carpet-weaver, he finished work on a Friday, so the story goes, and travelled to the Netherlands the following day. He spent a quiet Sunday, competed on the Monday, then set off back for Tayside on the Tuesday. Smith went on to win several Scottish cross-country titles, and, as his daugher remembers, he excelled at other sports too – though not all have received Olympic recognition. “He taught us to swim, because he was a good swimmer. He won medals for swimming and gymnastics. He was really good at walking on his hands as well. Even in his 50s and 60s I remember him walking on his hands about the house. Once, when he and some other Harriers runners were on their way home from a meeting in England, they had to change trains at Crewe. While waiting there, they met a group of acrobats and had a game of football, which the Harriers won. Rightly proud of her father and of the colleagues with whom he ran, Gibson feels more should be done to celebrate the achievements of those past generations of sporting Scots. She certainly believes that Dundee itself could do more to honour a man who was once one of its most famous citizens.